The distant sound of a raven echoed as this classic Hibben design was being ground on the sharpening wheel. This Raven offers a black ABS fluted grip with a gold-plated twisted wire wrap inlay. 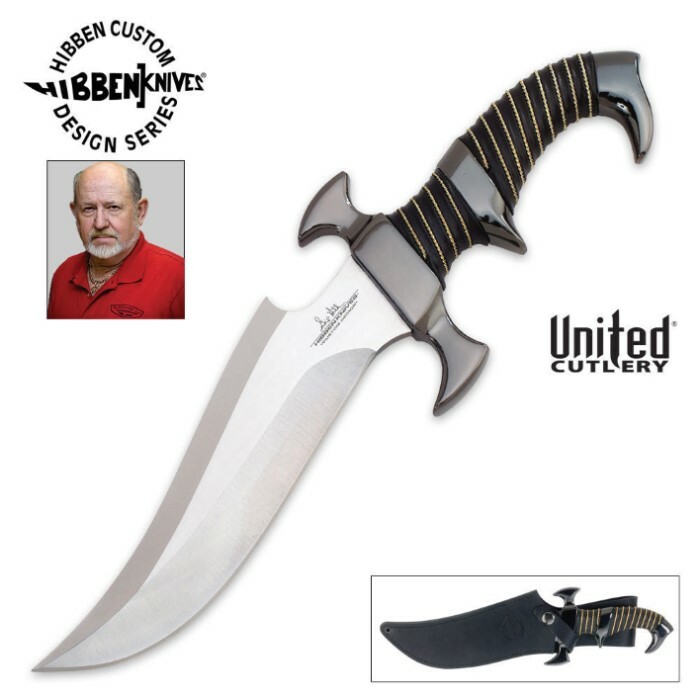 The guard and sub-hilt are black-mirror-polished sliver plated for a dark effect whole the 7 1/4" 420 stainless steel blade features a brightly polished finish. 12 1/2" overall. 7 1/4" blade. Bought this knife just a few days ago, received it quickly, and I love it. The hilt, sub hilt, and pommel are much darker than in the picture, more a smoky black, but it fits the color of the grip so elegantly. It came sharp, not dull at all, and is very sturdy. Only complaint is that it came with some water marks on the steel that wont come out so easily. But nonetheless, this is without a doubt, the MOST beautiful knife I will ever have. Completely and utterly satisfied. Thank you True Swords! You rule!